Here there be robots for Jensen to destroy. Or avoid. Many games are not islands, they don’t just spring up. Deus Ex Go is the third in the Go series by Square Enix and stands very much alongside its predecessors, Hitman Go and Lara Croft Go. While this a review of the latest title, let’s talk a little about the series in general first, because it’s interesting both from a gameplay standpoint and also as a business case. Meh. It’s OK. It’s not entirely a rehash, but there aren’t enough new mechanics to really hold up interest in the game. Too few levels. Square Enix made a very smart decision developing the current trio of Go games: in the run-up to a major franchise release on console and PC, release an inexpensive mobile game for that franchise. These aren’t so-called “second screen experiences” like The Division’s cancelled in-game drone app, or Destiny’s app that contains all the lore the actual game is missing. Each Go game is a paid app, unique to itself. Hitman GO was a fresh experience that tasked players with assassinating target pieces whilst avoiding the pawns that guard the map on predictable and unique paths and behaviours. The board game aesthetic is enough to set the game apart from it’s AAA roots but the optional subgoals – Don’t kill enemies, pick up briefcase etc – and the pickup disguises helped make it feel like it wasn’t something completely different with a brand name slapped on by the marketing department. Great care was taken to translate what made Hitman fun and make a puzzle game out of it that perfectly fit its new platform. Lara Croft GO was released in early 2016 to coordinate with Rise of the Tomb Raider. This was thankfully more than just pasting the Croft name over the previous title. Whereas 47 sneaks into trees and tries to avoid being seen, Lara has to avoid being crushed by the environment and lure enemies into traps she had to avoid herself. The board game feel is ditched for something more fluid (a Lara-shaped static chess piece can hardly swan dive, after all) but it retains the tactile simplicity of its predecessor. And so we get to the latest GO. In terms of its mechanics, the Deus Ex instalment lacks the variety of either Hitman or Lara Croft. The environment based puzzle elements are gone leaving only the enemy AI to be careful of. 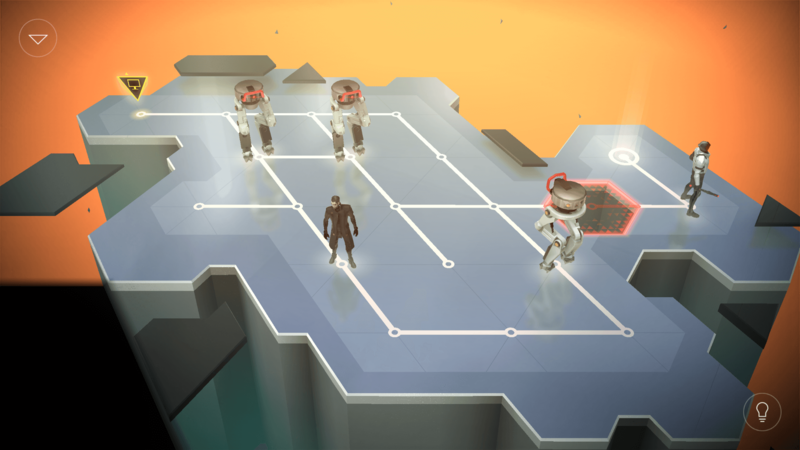 There are no optional objectives and the levels are now a just a series of numbered buttons on a line, rather than the game boxes or journals that packaged the levels in previous games. Throughout the game, the player gains access to several mechanics inspired by Deus Ex series. Adam can pick up a powerup that allows him to turn invisible for a turn or remotely control some hacking PCs that the player has to otherwise move to that spot to use. The enemies are also inspired by Deus Ex, but without the environmental puzzle elements from Lara Croft Go, the game gets quite stale by the end. Considering the wealth of augments, enemies and game mechanics present in the main series, it’s disappointing that this is all that’s made it over. In Human Revolution and Mankind Divided, players can compete missions stealthily or combat heavy, reminiscent of Hitman, so it’s a real shame to not see the optional objectives from before to carry over into this. Over than trying to complete missions in a specified number of moves, there’s no reason at all to replay levels. This means the 54 levels present, regardless of whether this is more or less than previous games, feel very lightweight and the game ends all too quickly. Levels, and why are they trying to retain users? For the first time in the series, the game has a dialogue driven narrative. At the beginning of certain missions Adam will talk to two non-playable characters in an effort to give context to the missions. However, these dialogues play on top of the gameplay and are more of a distraction from what I want to be doing than an engaging narrative, so I pretty much overlooked it. It commits the cardinal sin of storytelling in games: story segments you can’t skip. I’m here to play a cool puzzle game, not read dialogue boxes. The dialogue itself is somewhat witty, but mostly unremarkable and serves really only to convey plot rather than develop any characters or do anything of interest. I could describe the plot point, because there really is only one, but the story fails to engage in either its plot or its presentation. Lara Croft Go instead simply allowed the player to see the tombs grow and evolve and that was enough to give a sense of story without the forced narrative in this edition. Simply describing the story on the loading screens would have been simpler and less intrusive to the gameplay experience. All in all, Deus Ex Go is an odd duck in the franchise. It seems to have dropped parts of previous games that I really like (aesthetics, mostly), thrown in a story which somehow manages to be half-baked and overly intrusive at the same time, and it seems like they just ran out of good ideas early. Considering the number of augmentations available in the franchise, you would think there would be more depth and a longer play time here. I can only assume the plan was to build level packs, patch the menu to showcase them and release them later on. It’s now been more than a few months since launch though, and I would’ve expected packs to release early to benefit from and maintain the momentum after launch. Deus Ex Go is OK. It’s not amazing, it’s not terrible, it’s OK. It’s cheap, which is good, but it riffs on the other Go games rather than evolves. It’s a weird one actually. Whereas Lara Croft Go felt like a progression of Hitman Go, this feels like a side-step. It’s not growth, it’s an alternative. I have all three games installed and switch between the first two when I get bored, but I’ve finished Deus Ex and I’m done with it. It has so much potential but lives up to very little of it.